For each species account, we present a variety of histograms (specialized bar graphs) to compare and contrast the responses of plant species to environmental gradients, such as elevation, slope, and aspect. Data shown in the histograms come from the landscape scale vegetation monitoring program of over 1000 permanent plots in 45 study areas within Denali. To aid in comparing different responses among closely-related species, multiple related species are usually shown on a single bar graph. Our histograms convey either the frequency of occurrence or the percent cover of a species versus an environmental variable.  Percent cover is a common way to represent abundance of a plant species – and literally indicates the percentage of a given area of ground that is covered by that species. The higher the percent cover, the greater abundance of a species. 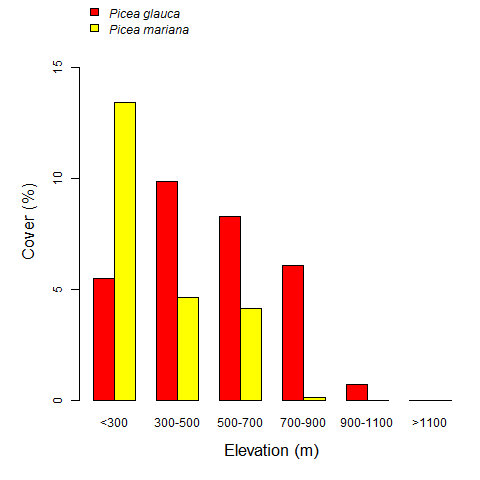 Looking at the percent cover histogram for Picea (spruce) species vs. elevation, we see that the peak abundance of Picea glauca (~10% average cover) occurs between 300 and 500m elevation, and there is 1% average cover in the elevation zone between 900 and 1100 m in the Park. Picea mariana is most abundant (~13% average cover) in the lowest elevation areas of the Park (<300m) and declines with increasing elevation, with no cover above 900m in elevation. Frequency of occurrence refers to the percentage of plots in which a species occurs out of the total number of plots. For example, if there are 20 plots in a category (i.e., the 300-500m elevation band), and a species occurs in 2 of these plots, then the species’ frequency of occurrence is 10% in this group of plots. The frequency of occurrence histogram shown here depicts a related, but different facet of the responses of the two spruce species in Denali to the gradient of elevation. This histogram displays data on the occurrence of a species in a plot rather than the abundance of a species (percent cover). So this means that if a tiny seedling of P. glauca was present in a plot it carries the same value as if a 30m tall tree occurred in the plot – it is noted as “present” either way. The percent cover and frequency of occurrence histograms are just two ways of summarizing how plants are distributed along topographic gradients in our landscape scale dataset. Together they encapsulate important differences in the ecology of particular species, and contain a great deal of novel information specific to Denali’s plant species. Comparing the figures above you can see that similar underlying patterns exist for the frequency of occurrence and abundance of the two Picea species, but that the ranges in elevation of occurrence is larger than for abundance. 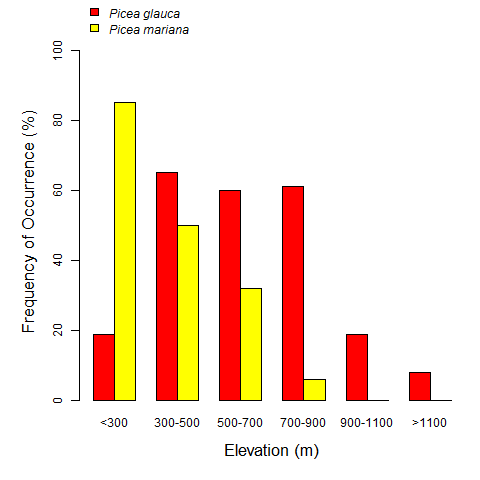 For example, the histograms show that while there was no cover of Picea glauca above 1100m in elevation, it did occur in about 7% of the plots in this elevation zone. The histograms shown here highlight just one topographic gradient – elevation, but in species accounts you will see bar graphs displaying percent cover and frequency of species along gradients of slope and aspect. Slope is the inclination of a plot in degrees so that a vertical cliff would have a slope of 90˚. Aspect is a measure of which way a slope is facing. In our histograms, we present the aspect as “Off-180 Aspect” – the deviation of a plots aspect from due south (180 degrees). 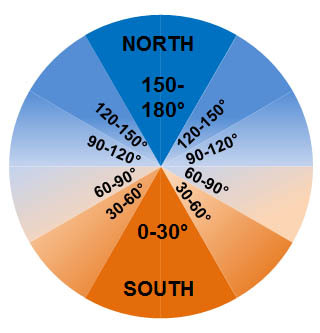 Off-180 aspect helps clarify the ecological importance of the species-aspect relationships because due-south-facing (180 degrees aspect) equates to the warmest (and often driest) locations in the landscape. In practice, this value is the absolute value of 180 minus the plot aspect (so that negative values are made positive). For example, a plot with a measured aspect of 10˚ (north-facing) would have a 170˚ off-180 aspect (180 – 170 = 10), as would a plot with a measured aspect of 350˚ (180-350 = -170). Thus, off-180 aspect is basically a measure of the south-ness (low values) or north-ness (high values) of a plots location. The categories we use in the histograms are visually demonstrated in the diagram at right. Moist to somewhat wet sites. key to your mobile device.